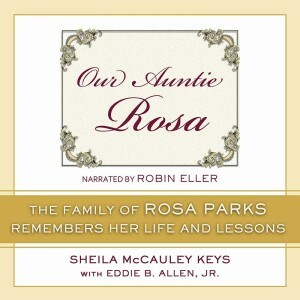 A conversation with Robin Eller, narrator of Our Auntie Rosa: The Family of Rosa Parks Remembers Her Life and Lessons By Sheila McCauley Keyes with Eddie B. Allen, Jr. Ideal: We’re so happy to have you here to discuss Our Auntie Rosa. Robin: Thank you for having me! Ideal: We loved your narration of this family memoir from the nieces and nephews of Rosa Parks. One of the things I appreciated was how beautifully you handled the fact that in each section you told a story by a group of anywhere from 2-6 people but it was written as if the narrator were one person. How did you approach that unique format? Robin: That’s a great question. After careful thought and a discussion with Ideal… it would have been impossible to be six people. I felt it was best to just tell the story from my heart. All of these segments were heartfelt and therefore it made it easier for me. Ideal: That’s one of the reasons we chose you. You have a wonderful intimate quality to your narration, and this book was full of very personal stories about what Rosa Parks meant to her family. Did you feel that this book revealed more about her than you had known from history? Robin: Absolutely! Unfortunately, we are only given a limited amount of information in school regarding African-American history. With that said, it’s no surprise that most people know very little about Rosa Parks; other than that historic day. One would have to do more research to find out more details. What is written in this book would only be known by her family members. In fact, it was put to the test, when I read a portion for a group of well-read Seniors at a Black History Month celebration. Ideal: What was their response? Robin: I read an excerpt about how the bus driver had given Rosa Parks difficulty prior to her taking a stance on December 1st, 1955. They had no idea that Rosa would pay her bus fare, walk back outside to the back of the bus as required during that time and the busy driver would sometimes pull away without her. They were stunned. I continued to read the details of what happened next and how Rosa Parks mentioned how kind the police were to her at the station. She said, “They even gave me some water.” Of course the entire audience said, “What? ?” After I read the excerpt, I asked for a show of hands of who was hearing this part of the story for the first time. Each woman in the room raised her hand. I was told today by one of the Ebony Ladies Of Distinction that the ladies are still talking about the reading. Ideal: When I first read this book, I thought that even though it was written as an adult memoir, it would be good for both middle grade and high school children to read, since it did such a great job of bringing history to life. It fleshed out the story, and enhanced our understanding of Rosa Parks as a person, and her longtime support of the civil rights movement. I hadn’t realized that she was active in the civil rights movement both before and after her historic act. Robin: Rosa Parks worked for the NAACP. She was a longtime member of the Montgomery Chapter. At the time of her arrest, she was secretary of the local chapter. In fact, she was sent to interview another woman who had been arrested before her. In terms of this being a book that would be good for middle school kids, it is important for them to know that she was considered more than an aunt, she was a second mother to her nieces and nephews when they lost their mother. They looked to her for advice and on one occasion she surprised her nephew by being the guest speaker at his middle school. Ideal: It sounded like she was someone the children looked up to personally, and they respected her place in history. What did you learn about her character? Robin: She was very humble and a student of life. She was open to new experiences and embraced them. It is usually said that as people age they are stuck in their ways. This woman was the opposite. Her favorite dish was calf’s brains and scrambled eggs; however later in life, she became more health conscious, shopped at co-ops and shared ideas about nutrition with her niece Shirley. Rosa Parks took up yoga in her senior years and even walked around her home in yoga pants. I think she’s pretty darn cool! Ideal: That must have especially resonated with you because of your background in dance! Can you tell the listeners something about your background before you became a narrator? Robin: I have always been a performer. I’m an actor. I was a professional dancer and I even sing. They say you’re supposed to be a triple threat and I trained as much as I could. I was a dance education major in college. I was teaching in after school programs and choreographing for high schools and got a break to perform in Japan. It was hard to leave my students; however they understood and I never looked back. I lived my rock star life. I traveled the world as a dancer with the legendary James Brown. I met so many interesting people. One of the highlights of that tour was meeting Coretta Scott King in Montgomery Alabama. Talk about life coming full circle with narrating Auntie Rosa! I booked commercials and got some TV gigs too. One of my most memorable experiences as a performer was doing the musical Ragtime. It was such a special show! The music, the choreography, the cast! I’m so blessed to have been a part of this beautiful production. I shared the stage with some talented people! What an honor! So many lifetime friendships began in that show. I used to travel to Italy often and had a number of singing opportunities there as well. The idea of doing audiobooks was presented to me a long time ago; however, I was on a different journey. I believe things happen when they are supposed to or one keeps walking into the same wall until one figures out another way to either go around it or break it down. LOL! Audiobooks feels as much as home for me as the stage. Within this community, I have formed lifetime friendships as well. Ideal: In addition to Our Auntie Rosa, you have narrated other memoirs. Do the books you narrate affect you personally? Have you gained insight or changed because of a book you’ve narrated? Robin: I probably place a bit of pressure on myself to do them justice. It’s because I care so much. It’s a huge responsibility to tell someone’s truth. Reading someone’s trials and tribulations in life can be inspiring and sometimes painful. Because I have been fortunate to narrate memoirs that have been written by celebrities who are deemed icons, I have gained a lot of insight into their lives. It takes great courage to share intimate parts of your life with the world. I do my best to handle their stories with care. If I have changed in any way, I have become more sensitive to what is written and look at the world or a particular person a little differently. I learn something about someone that I didn’t know before, which is always great. Ideal: I know you recently had a chance to take part in an organization that is bringing another little-known piece of history to life. Can you tell us about it? Robin: I would love to. Did you know that Los Angeles has an African-American Firefighter Museum? This museum is an important piece of the history of Los Angeles. There was a time in Los Angeles when African-American firemen were only allowed to work at two stations and that’s just a small part of the story. Even with integration there was great resistance from their co-workers and society. Hard to believe, I know. This particular station is so far the only freestanding African-American firefighter museum in the United States. They are going to reinvigorate how they share the history of these firemen, which will include an audio tour. I have the privilege of being the voice that shares these indelible memories. Ideal: That sounds fantastic! I love that you are helping bring a wealth of rich history to the listening audience. Thank you so much for joining us, and for your narration of Our Auntie Rosa! Robin: Thank you for having me. It was an honor to share this important part of history.